NWCGA Boys played Cheshire Boys at Aldersey Green GC Monday 23rd July. NWCGA Boys played Shropshire & Hereford Boys at Northop Hall GC Sunday 20th May. CONGRATULATIONS to Archie Davies - Carlisle Golf Club winning the North Wales boys with a 283 total winning by 4 shots from Thomas J. Matthews - Oswestry Golf Club. Matthew Sandoz won the Bob Pressdee Trophy closed event for the North Wales boys 293 gross & the Platt handicap cup with a total of 281. NWCGA Boys played Staffordshire Boys at Newcastle-Under-Lyme Sunday 29th April. The morning started with the final foursomes a player short, which resulted in a loss of point before we started. Luckily, we got David Williams from Wrexham to play in the afternoon. The match result is slightly disappointing but again the average age was 15 with Charlie McKinney just 12 & Caolan Burford age 13, they will all learn from their experience & will prepare them for future years as County players. Staffordshire produced a more mature & experienced team most of whom played last year. Our juniors next year will have gained valuable experience & hopefully we will be able to give them a better game next year. Thank you to all the players & to the Captain Connor Jones & Sion Coleman for all their help & a final thank you to Joe Williams’ dad for assisting in the last minute transport arrangements. Congratulations to Connor Jones - Aberdovey GC Winning the CWB with rounds of 71 & 75 total 146 & Tom Peet Pyle & Kenfig GC Runner-up with rounds of 69 & 77 total 146. The standard of golf was phenomenal Shauna Lyons made her debut for the boys team and won one of her matches in a scratch format from the same tees. The men very narrowly beat the Juniors in a scratch matchplay format where each player played 2 opponents. Myself and Men's County Captain Paul Roberts were extremely impressed with the excellent standard of golf and attitudes displayed by all during the day at North Wales GC. 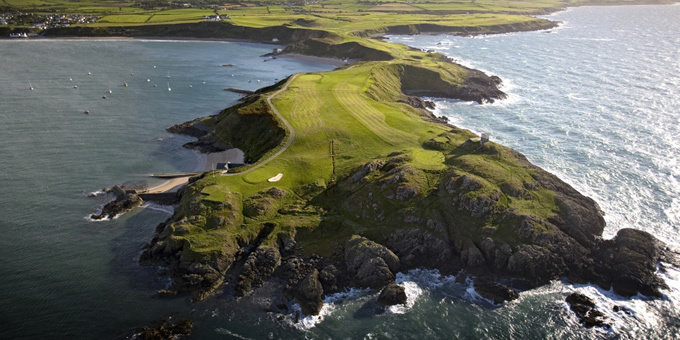 With such talented juniors in the County we will look at holding a rematch at Porthmadog GC around March 2018. A big thank you to everyone for the support today and let's look forward to County Golf in 2018. Team players & individual match scores goto Juniors Results page. Congratulations to the NWCGA Boys for winning the Final match of the season. It was played in light wind & rain but the boys & girls just got on with their matches to their credit. We had 3 new boys playing their 1st match for NW Boys Caolan Burford (NWCGA U13 Champion), Evan Povey & Charlie Mckinney all winning. Caolan 2/1 giving away 16 shots, Evan 8/7 giving 18 shots & Charlie 6/5 giving 14 shots. We also had good wins for Daniel Rumsey 7/6 & Captain Siôn Coleman 3/2. Individual Scores U13's/U15's Nett & Gross goto Junior Results page. Congratulations to Joe Price Williams, Rhos-on-Sea GC winning the U15's Championship at Henllys GC on Monday 7th August with a total gross of 80+76=156 & Joss Lerwill, Newport (Pembs) runner-up with 81+83=164. Caolan Burford, Rhuddlan GC won the U13's Shield with an excellent gross 77 playing off a handicap of 5. The Inter County Championship was won by Denbighshire 555 & Runners Up Flintshire 573. Prizes on the day were sponsored by Conygar Investments PLC. The Cheshire match morning foursomes looked as if we were going to have a good score being up 2½ points as well as being ahead in the last two going down the 12th green but the Cheshire boys played some very good golf & won the last two matches to make it 3½ - 2½ to Cheshire. In the afternoon our captain for the day Siôn Coleman got us off to a good start winning 2H. After this the Cheshire team proved to be better than us on the day winning the next 7 singles before Macey Roberts got our only other singles win - winning 3/1. Due to the unavailability of some of the older players we had to depend on the younger & higher handicapped players for the NWCGA matches but despite this I don’t think we have not done too badly overall. The team has been made up of players age 11 up to 18 years old. In the Cheshire match we had two 18year olds three 16 year olds two 14 year olds and the rest were aged between 11 and 12 year old. Hopefully in the next year or two with experience and support we will see the progression of the younger players in North Wales and wining some of the matches and not a close second. Before the foursomes matches started Shropshire & Herefordshire had a one point advantage as match 5 was a walk-over due to the non arrival of a player. The boys rallied to take 3 of the remaining matches & halve one leaving NWCGA boys ahead 3½ - 2½ after the morning foursomes. The afternoon singles proved more of a challenge even though Jack Williams (Wrexham) arrived to play in the afternoon singles at short notice. Jack played well against a boy off 5 handicap only losing on the 17th green. Overall an excellent day for the young boys with wins for Robbie Davies, David Williams & Macey Roberts giving the team valuable points & experience in their singles matches. Joe Price Williams was very unlucky not to get a point but secured a well-deserved half. Congratulations to Luke Harries Tenby Golf Club winning the North Wales boys with a 290 total winning by 4 shots from Tom Froom Nefyn & District Golf Club. Tom Froom won the Bob Pressdee Trophy closed event for the North Wales boys. The Platt handicap cup was won by Robbie Davies Abergele Golf Club with a total of 288. See Junior Results for individual scores. The match was very close with the foursomes finishing 3 matches each with Laurence Chesworth & Sion Coleman winning 7/5, Reuben Bather & Connor Owen winning 5/4 also Adam Wilson & Steffan Hughes winning on the last. After the morning Foursomes we were looking for a good start in the singles but started with only 1½ points from the first 6 matches which was going to be hard to come back from but in the last 6 matches we won 4 points with the match going down to the last with Reuben Bather securing the ½ point. One or two let good leads go finishing with ½'s which would have been the difference between winning and losing. NWCGA would like to take this opportunity to congratulate Mold GC on their fantastic achievement for being voted the best Junior Club in Wales for 2016. The club feel very proud of this award & congratulate John Roberts & Ann Marie Moore for their hard work and continued commitment to the Junior section. Several young players on both sides, five under 13, made their debut in this match and showed great promise as well as gaining invaluable experience in difficult windy conditions. The boys team came through strongly at the end to retain the Trophy for the 3rd year running. Congratulations to Connor Owen (Left) Aberdovey GC winning the President's Cup, U13's & U15's boys championship with a total gross score of 140 for 36 holes & the Runner-Up U15's Harry Griffiths (Right) Mold GC. Gross scores goto Juniors Results page. & we look forward to welcoming you again in 2017. Unfortunately, this match clashed again with the Welsh Amateur Championship & another prestigious Junior Competition resulting in our seven Welsh Internationals & five other first choices unable to play. Two promising 13 year olds made up today's Team and to the credit of all the players they performed well & to the best of their ability but were not at the level of the experienced Cheshire Team which was made up of mainly scratch players & Captained by a +2 handicap English International. The spirit and discipline of our Team could not be faulted. Congratulations to the following boys selected to play the match v Cheshire at Pryors Hayes GC on Monday 25th July 2016. Congratulations to Elis Wyn Lewis from Borth & Ynyslas GC the NWCGA Boys Champion 2016. The runner-up with the same total gross score of 286 & beaten on the last 18 was Luke Harries from Tenby GC. Luke warmly congratulated Elis on his win showing true sportsmanship to his fellow competitor. The Bob Pressdee trophy a closed event for North Wales boys the winner Thomas Roberts from Rhuddlan with a gross 293 & Liam Pritchard runner-up with 295. Winning the Platt Construction Boys Championship handicap cup was Adam Wilson from Abergele playing off a 5 handicap with a 278 total. it was a pleasure to run the championship for you & thank you on behalf of the NWCGA. Well done boys & we look forward to welcoming you again in 2017. Congratulations to the following boys selected to play the match v Shropshire & Herford at Padeswood & Buckley GC on Sunday 22nd May 2016. Congratulations to Jacob Davies (Mold) winning the Central Boys by a 4 shot margin 137 gross (-3) & Thomas Roberts (Rhuddlan) runner-up 141. Match Report: with 5 boys playing in the Fairhaven Trophy and 3 others off 2 handicap or less unavailable, 6 boys made their debut in this match, 4 of them 15 years of age. The final score did not truly reflect the performance of the team, the main difference being size and level of experience. The effort put in by the team was first class and the experience gained on the day will stand them in good stead for the future. Ross Peters (Flint), Tom Roberts (Rhuddlan), Adam Wilson (Abergele) & Harry Griffiths (Mold). Non Travelling reserves: Laurence Chesworth (Aberdovey) & Matthew Roberts (Padeswood & Buckley). Team players & individual match scores goto Junior Results page. Congratulations to the following boys selected to play the girls at North Wales GC on Sunday 27th September 2015. Congratulations to Harry Bartley Clays GC winning the U15's boys championship with a winning gross score of 142 & to Matthew Sandoz also from Clays GC winning the U13's boys championship with a gross 77. Congratulations to all the competitors it was a pleasure to run the championship for you & thank you on behalf of the North Wales Counties Golf Association. Good luck to the boys playing in the Welsh Boys U15's 20th August. Well done boys & we look forward to welcoming you again in 2016. The NWCGA boys’ team had 13 players unavailable as they were playing in the Welsh Amateur Championship so the team fielded 8 players making their debut. Considering their lack of experience the boys gave a good account of themselves but unfortunately this was not enough to beat a strong Cheshire outfit. However the experience gained will undoubtedly prove invaluable in the future. Congratulations to Ben Chamberlain (Padeswood & Buckley GC) winning the Welsh boys championship at Abergele on the 20th hole from Luke Harries (Tenby GC) & to Jordan Pearson (Clays GC) winning the plate 2/1 from Elis Wyn Lewis (Borth & Ynyslas GC). Laurence Vargas (St. Pierre), Callam Morris (Monmouthshire) & Ben Chamberlain (Padeswood & Buckley) who have been selected to represent Wales in the European boys Team Championship at Pickala GC Finland 7th - 11th July with Thomas Froom (Nefyn & District) & Aled Greville (Ashburnham) selected to represent Wales at the European Young Masters, Domaine Imperial GC, Switzerland 23rd to 25th July. Congratulations to Laurence Vargas St. Pierre winning the North Wales boys & Ben Chamberlain winning the Bob Pressdee Trophy (North Wales Boys only). Congratulations to all the competitors it was a pleasure to run the championship for you & thank you on behalf of the North Wales Counties Golf Association. Well done boys & we look forward to welcoming you again in 2016. George Burnett St. Pierre is leading the field after the 1st round with an excellent gross 67 with John Roberts, Denbigh & Laurence Vargas St. Pierre both with 70 gross. See Junior results for 1st round scores. The day started with grey skies and some light rain but the sun came out and shone on the Denbighshire boys. The final outcome being Caernarfonshire losing their matches 9 to 3 but as the full results show some matches were close. Shaun Harpin (North Wales) & Sean Wilson Davies (Pwllheli) played exceptionally well against Lewis Mackenzie (Wrexham) & Sean Plunkett (Clays) winning their match 4/2 unfortunately the only win in the foursomes. The matches where played in good spirit on both sides, with some excellent play by both teams, even though Caernarfonshire Boys were defeated the score was a slight improvement on last years of 11 matches to 1. Caernarfonshire & District Golfing Union would like to thank Clwb Golff Pwllheli for the courtesy of the course, Stuart Pilkington the Professional for his warm welcome and to Ann Thomas for the catering. Caernarfonshire wish Vic Pritchard Denbighshire County Organiser and his boys all the best in their next two matches against Flintshire & Anglesey later on this year. Well played and good luck. Without our 3 Welsh Internationals, the Team again, in successive matches, have performed admirably and managed a rare achievement in the afternoon singles of not losing a single match. Team spirit is excellent and the belief the boys have developed in themselves is resulting in confident performances. With three Internationals not available for selection the team produced a magnificent performance on the day. The boys' concentration and determination shone through and resulted in the best ever achieved by a North Wales team. Congratulations to Ben Chamberlain, Padeswood & Buckley winning the Central Wales Boys Championship at Borth & Ynyslas at the weekend. Ben will be hoping for the double when he tees off at Rhuddlan GC 30th May in the North Wales Boys Championship. The match began at 9.30 am in thick fog and eventually the sun came out to shine on both teams. Last years match was a thriller with three games being decided on the 18th hole. This year was even closer, after the foursomes in the morning Flintshire were leading by 1 shot 2½ to Caernarfonshire 1½. The afternoon singles played in glorious sunshine was were the battle commenced, resulting in another thrilling match going to the wire with the final pair finishing their match all square & the singles matches a total of 4 games each. Flintshire being the victors by the one shot after the foursomes in the morning. Both counties would like to thank Hawarden Golf Club for the courtesy of the course and to Nicola for the catering. Congratulations to the Flintshire team, Welsh Inter Counties Junior Champions & to Kevin Peters Flintshire County Organiser. The following boys have been invited to attend the U13's coaching session at Conwy GC on Sunday 22nd March 2015. Tuition will be provided by Andrew Black the resident golf professional at Conwy golf club. 10.15 am Registration 10.30 am - 12.30 pm – Tuition 12.30 pm - 13.30 pm - Lunch. 13.30 pm - 16.30 pm – Weather permitting the group will go on the course to play 6 or 9 holes with the professional in attendance giving tuition and advice. A certificate will be awarded to all junior participants to mark their achievement on the day. NWCGA U13 boys with their medals & certificates presented by Andrew Blake PGA Professional Conwy GC. Joe Williams (Penmaenmawr GC) emailed NWCGA " I really liked the sessions on Sunday; I thought they were great. I am practicing the drills already and they are helping my chipping & putting a lot. Thank you for organising it and I hope it could be put on in September as mentioned on Sunday."